Can I buy Additional Magnets? Yes. You will find additional magnets for sale under Our Products/Scrap'n Easel. Can I buy Scrap' Easel in stores? Scrap' Easel is a very new product and most of our sales are on the internet. However, we do have retailers shown on our Retailer's Page. 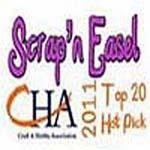 Scrap'n Easel is not yet available in the big box stores. Can I cut on Scrap'n Easel? Does Scrap'n Easel Come In Other Colors? No. Black was chosen as the only color for Scrap'n Easel so that the color of the easel will not interfere with the colors of your designs. What is the extra Velcro set used for? Two sets of Velcro are included with your Scrap'n Easel. One, obviously is to be used to keep the easel closed. The other is to be used if you are using the easel in "display" mode. An additinal velcro dot can be placed on the outside of the tab to "pull" the tab to the back of the easel. This way the tab will not be in the way when you are demonstrating using Scrap'n Easel. Do you sell to retailers or offer volume discounts? Yes. You there is a "Join Our Mailing List" link on the Home page of our site. Yes. You can read about it on our Guarantee Page. We ship Fed Ex Ground in the US and all international orders except Canada.